A girl with a sword - looks like my kind of book! And she has green eyes, too - bonus points :) Here's another Take 10 interview with debut YA author, T.G. Ayer. I met Tee in Auckland, New Zealand when I was attending the NZ Romance Writer's conference. She's super nice and we've become friends. 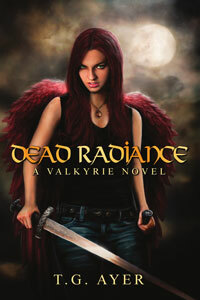 Her fantasy novel, DEAD RADIANCE was just released and I'm a part of her blog tour! Leave a comment for Tee and I'll enter you in to win a signed copy of my book INSIDE (includes Inside Out and Outside In). To be eligible comment by midnight March 2st EST, and include your email addy so I can email you the good news. This is open world wide! A Fantastic Deal - INSIDE is 2 books in 1! The cover is from the UK edition - they always do a beautiful job - I've been very lucky with my covers from all over the world. 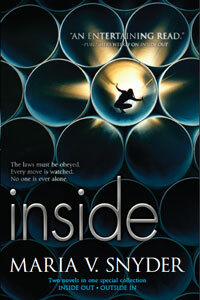 Here's the back copy: The world of Inside is simple. Do your job, stay out of the way and don't dream of anything better. Because as every Scrub knows, there are no other options. 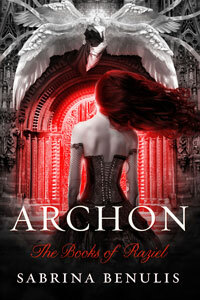 Today I have an interview with Sabrina Benulis about her debut novel, ARCHON which was recently released! Isn't the cover gorgeous!! Sabrina was a student at Seton Hill University when I attended - I graduated before her but we SHUers are a close knit group :) I will admit I haven't read ARCHON yet (my bad!) - but it sounds fascinating and a copy is on the way. Sabrina is also offering a signed copy of ARCHON to one commenter - please include an email addy so I can get in touch with you - the contest ends midnight EST Feb. 23rd 2012 - US/Canada readers are only eligible for the book. However international readers who leave a comment will be able to win a signed cover flat from one of my novels (a rare collector's item :). Please let me know if you are not in the US/Canada in your comment. Here's the cover copy: There are some things worse than death . . .
Yep - it's my fault. I put a jinx on winter here in Pennsylvania. It started in late October - the 27th to be exact. A friend from Montana asked me if it had snowed yet in PA. I answered her with a "It never snows here in October - we get all our snow in January and February." 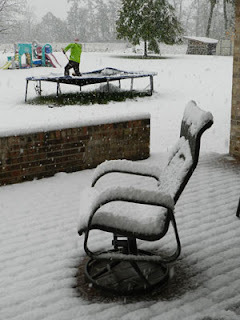 Uh huh... Well it snowed 6 inches on October 30th in a freak storm just to prove me wrong (see pictures). And we've had no significant snow in Jan or Feb and with many days in the 60 + degree F range, I doubt we'll have any. Plus it messed up the weather on a global scale and I believe Europe and Alaska are getting all our snow.